CITY HALL — Chicago remains the rat capital of the United States of America — at least according to a pest control company that stands to profit from the effort to fight the disease-ridden vermin. Based on the number of residential and commercial rodent treatments ordered in Chicago's major metropolitan areas from September 2016 to September 2017, Orkin named Chicago the "rattiest" city in America for the third-straight year. New York and Los Angeles round out the top three, with the City of Angels moving up one spot from last year, according to Orkin. Mayor Rahm Emanuel Friday proposed spending an additional $1.5 million in 2018 to get rid of rats. That budget boost will allow the city to add five crews of workers charged with reducing the number of critters scurrying through Chicago's streets and alleys, officials said. The boost will bring the number of rat control crews to 30 in 2018, officials said. In spring 2016, the city had eight rat control crews, records show. In addition, Emanuel will ask the City Council to earmark an additional $500,000 to buy 10,000 new black garbage carts to replace those gnawed through by rodents determined to make a tasty meal of refuse, officials said. The city received 39,000 rat complaints in 2017, and responded to all of them within five days, officials said. That's up 30 percent from 2016. Department of Streets and Sanitation spokeswoman Sara McGann reminded Chicagoans that the best way to keep rats away is to keep garbage covered in alleys and yards free of pet waste. 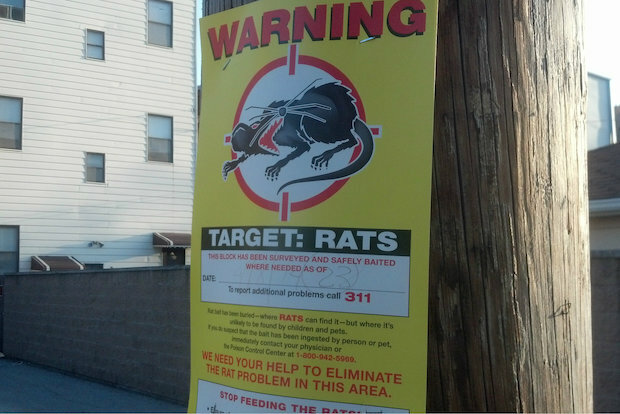 Every complaint about rats is responded to in no more than five days, McGann said. However, in 2015 Commissioner Charles Williams called Orkin's ranking "self-serving" and without merit. The explosion in Chicago's rat population has been caused by three consecutive mild winters and a boom in construction projects that disturb their underground lairs, city officials said.